Dull, dry-looking skin, blemishes and even lines and pigmentation are just a few of the things that can be improved by the simple act of exfoliation. But, only if you’re doing it right! 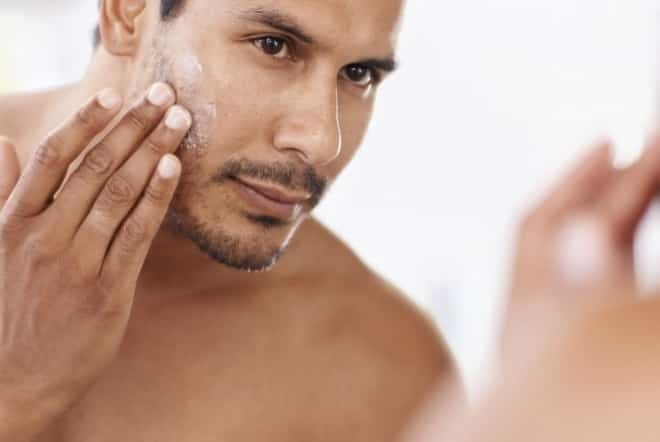 If not, your skin-sloughing routine could actually be making things worse. Fortunately, we’ve got some good advice on how to scrub up nicely. When you hear the word ‘exfoliator’ most people think of a grainy face wash which is a prime example of a ‘mechanical exfoliator’. Mechanical referring to anything that’s abrasive and can be used to shift dead skin cells from the surface. If you don’t have acne, a grainy scrub can serve you well. If you do, however, it’ll only serve to irritate and inflame, ultimately making your condition worse. Also, mechanical scrubs using beads or grains won’t do much for blackheads. They’re too large to penetrate your pores and thank goodness for that. What would happen if they got stuck there? If blackheads and pimples are a problem, you’re going to be better off using a chemical exfoliator. For example a face wash or leave-on product that contains an exfoliating acid. There are two types to pick from – alpha hydroxy acids (AHAs) that include glycolic and lactic acid and beta hydroxy acid (BHA). AHA’s do a great job of exfoliating the surface of your skin so they’ll ‘peel and reveal’ as well as help prevent ingrown hairs. BHA, however, is able to penetrate deep inside your pores. This makes them an ideal choice for blackhead-busting and deep pore cleansing. The best way to remember which does what is that AHA’s exfoliate ‘above’ and BHA exfoliates ‘below’ and an ideal skincare routine makes use of both. Just two of our favourite chemical exfoliator products are SkinCeuticals Blemish + Age Solution toner (it contains both AHA and BHA) and Neostrata Resurface Smooth Surface Daily Peel 10 AHA pads. If you’re dealing with a serious case of blackheads, experiencing proper acne as opposed to an odd pimple or simply want to exfoliate like a boss then make an appointment at Skin Renewal. One of our favourite ways to exfoliate mechanically is via microdermabrasion. The procedure involves blowing a jet stream of micro-fine crystals across the surface of your skin, essentially ‘sandblasting’ it, but in a way that’s so quick and painless, you could easily do it in your lunch break. When it comes to chemical exfoliation, we peel masters and have a myriad for you to choose from. Our beta hydroxy peels are a BHA option that’s ideal for anyone with an oily skin type, enlarged pores and struggling with blackheads. We’ve also got several AHA-type peels that range from mild to intensive to help you reveal and brighter, fresher-looking complexion; tackle pigmentation, improve acne scarring and soften the look of wrinkles. Almost all of our great value Pigmentation and Sun Damage Solutions treatment packages include a peel or two and while some are very mild and require no downtime, others might mean hiding away for a bit, but the results are totally worth it. If you make an appointment with one of our doctors or therapists they’ll be able to advise you as to which as well as how many would deliver the best results.